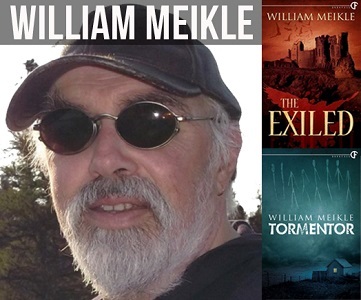 Willie Meikle is a Scottish genre writer now living in Newfoundland. With over twenty novels (such as The Invasion) and over 300 short stories published in genre presses, anthologies and magazines, he spends a great deal of time writing. When he’s not writing, he’s pretty fond of beer, playing guitar and dreaming of fortune and glory. We hope you enjoy the interview. WF asks: When did you first know you wanted to be a writer? WM: I started back in the mid ’70s at school. At first it was song lyrics, designed (mostly unsuccessfully) to get me closer to girls. I tried my hand at a few short stories but had no confidence in them and hid them away. And that was that for many years. It wasn’t until I was in my 30s that it really took hold. Back in the very early ’90s I had an idea for a story… I hadn’t written much of anything since school, but this idea wouldn’t leave me alone. I had an image in my mind of an old man watching a young woman’s ghost. That image grew into a story, that story grew into other stories, and before I knew it I had an obsession in charge of my life. So it all started with a little ghost story, “Dancers”; one that ended up winning a prize in a national ghost story competition, getting turned into a short movie, getting read on several radio stations, getting published in Greek, Spanish, Italian and Hebrew, and getting reprinted in The Weekly News in Scotland. Not bad for a first one. WM: As a full time writer without a big book deal, the biggest obstacle for me at the moment is lack of spare cash. We live frugally, in a small town in a remote community in Newfoundland. That means I don’t get to go to conventions, don’t get to socialize with other writers, and don’t get to drink nearly enough decent beer. As for dealing with it—we live, we go on. Someday, things will improve. WM: For me it’s mainly inspiration. I wouldn’t write at all if the ideas didn’t present themselves in my head. I find I get a lot of ideas clamoring for attention all at once. I write them down in a notebook that never leaves my side, and sometimes one of them gathers a bit more depth, and I get a clearer image. At this stage I find myself thinking about it almost constantly, until a plot, or an ending, clarifies itself. And, yes, there’s a certain degree of desperation in that I want to get better, to make the big sale, to see my name in lights, all that happy stuff. But I try not to think about that too much. Morkonan asks: Did any of H.P. Lovecraft’s works inspire you to journey into your genre? If so, titles and thoughts, please! WM: I discovered the writing of H P Lovecraft back in the very early Seventies as a reader long before I even thought about writing. I came to him, not looking for horror, but for Science Fiction as that was where my prime interest lay back then. I believe the first story I read was The Dunwich Horror in one of the cheap UK paperback editions. That was enough for me to seek out the rest, and I remember reading my personal favorite At the Mountains of Madness while sitting on the back steps of our house on a hot summer’s day. His world-view of cosmic horrors to which mankind is of no import whatsoever is something that resonated with me way back then and it was only natural that I should turn to some Lovecraftian conceits in my own writing. In recent years I’ve found there’s a wide variety of markets willing to share my obsession. My list of Lovecraft-inspired works grows apace. Morkonan asks: Lovecraft likely had no idea how much of an impact his work would have. What kind of impact would you like your work to have? WM: I’m happy just to be read and enjoyed. I have no illusions about leaving anything that will have historical impact— I’m a simple pulp writer, providing entertainment here and now. That’ll do for me. WM: I agree completely. The first book I remember reading was Treasure Island, and for me that’s still the gold standard I aspire to. I recently reread all the Conan stories too, and felt the old thrill you mentioned. I’d love to have a go at trying to recreate that with some of these characters. I’ve been lucky enough to have Sherlock Holmes and Professor Challenger stories published, and I’ve tried my hand at swashbuckling fantasy too. The one I’d —really—like to do would be Soloman Kane. Morkonan asks: If you were to describe one critical component of a heroic adventure story, what would it be? WM: High stakes adventure. I think that’s something that’s missing from a lot of fiction today—it’s all a bit too cerebral for me at times. Get a barbarian with a big sword in trouble and see where it takes him—that’s what I want to see more of. Popsprocket asks: How does the difficulty compare for a new author to break into genre writing, as opposed to, say, literary fiction or young adult fiction? WM: Short answer, I’ve no idea, as I don’t write outside the genres. A good story is a good story, whether you’re a new writer or not, and that’s what publishers are always looking for. J. Anfinson asks: To be successful in genre writing, do you believe it’s more important to write stories that captivate your own imagination (and hope readers will enjoy the journey as much as you) or is a beginning writer better off writing what’s trending and making an effort to do it better than everyone else? WM: I’ve always written what I want to write and then looked for someone to send it to. Chasing trends is difficult given the lag time, for what might be a trend when you start writing a novel can easily have blown itself out by the time you get yours in front of a publisher. A novel can take years from inception through writing, submitting, acceptance, editing, more editing and then, eventually publishing. Anticipating a trend that far in advance is something publishers try to do — but as a writer I think its counter productive. WF asks: Is there a genre you haven’t written in yet, but would like to? WM: I grew up with westerns. I have my Granddad to thank for days watching Wagon Train, Rawhide, Bonanza andGunsmoke, then later on, The Virginian and The High Chaparral. He also introduced me to Louis L’Amour and others as I devoured his collection of Western paperbacks. I’ve written a couple with supernatural elements, but I’d love to do a straight, a man’s gotta do what a man’s gotta do spaghetti western. Skodt asks: Writers have their favorite places to write. Some of us find that spot in our minds. What is your favorite place to write? As a man who enjoys nature, does this aspect help you in your writing? Skodt asks: You mention the novel John Carter, and say many writers would turn up their noses. Could you elaborate why you think this genre shouldn’t be overlooked? WM: Pulp is seen as second class by far too many people. People hear ‘pulp’ and think ‘shoddy’, whereas I hear ‘pulp’ and think ‘adventure.’ Storytelling for the sake of storytelling should not be lightly dismissed—not everything has to have deep psychological insight. Sometimes all you need to be satisfied is people in peril, and a bad guy to beat up. And there’s nothing wrong with that. Skodt asks: A quote on your website states “I write to escape. I haven’t managed it yet, but I am working on it.” Can you elaborate? WM: Taking the quote in context on the website, you’ll see I mentioned that I came from a working class background in a steelworking town where the works closed down. That’s what I was originally escaping from. More recently I’ve been escaping from a very boring job in IT, and even more recently, I’m escaping from the slow train wreck that we call civilization—it hardly seems civilized at all these days. WF asks: You’ve mentioned a number of your favorite well-known pulp authors (Lovecraft, Moorcock, Spillane, Haggard). Are there any newer writers in your genre(s) that stand out to you? Why? WM: Joe Abercrombie, while not exactly pulp, strikes me as having a pulp ethos. I love his fantasy work and to me he’s the best of the current bunch. In the horror field, again, he’s not pulp as such, but has the ethos, Adam Nevill is impressing me mightily. If you want a really scary read, he’s your current man. WF asks: What are you reading right now? WF asks: How much time do you spend each week on writing vs. the business of being a writer (marketing, administration, and everything else)? WM: There’s not much of everything else if truth be told—some website maintenance, a newsletter and answering emails. I’m pretty organized at all that kind of stuff, having had a management career in IT before going full time. In summary, probably about 80—90% of my work time is writing, the rest admin. Of course, work time is itself a fluid concept. I try to spend around 6 hours a day actually writing—most days I manage it, and it works out around 2000 good words a day most days. Over the course of a year that adds up to a lot of stories. WF asks: Did you get many rejections before getting your first story published? If so, how did you stay motivated in the face of rejection? WM: I sold the first three short stories I wrote — the first one even won 100 pounds in a nationwide ghost story competition in the UK. So subsequent rejections were always tempered by the fact that I knew I could do it. That, and a stubborn will not to be beaten keeps me motivated, some twenty three years later. WF asks: How do you think you’ve evolved creatively? WM: The main thing is that I’ve learned how to take my time with a story and give it room to breathe and grow to the length it needs. It’s not a creative thing as much as a confidence thing, I think. I know I’m a better storyteller now than I was back when I started—and that’s just a matter of reading enough, writing enough and developing an understanding how dialogue and description interact in getting the story told. I think I’ve always had imaginative ideas—it’s just that now I’ve developed the tools to be able to do them justice. WF asks: You’ve had over 20 novels and over 300 short stories published. What was the trigger that allowed you to ‘quit the day job’ and write full-time in 2007? WM: The first trigger came in 2005. I managed to place a story, “Total Mental Quality” in a big name professional Scottish science fiction anthology, Nova Scotia. I went along to the launch and got to stand next to multiple award winning writers like Charlie Stross, Hal Duncan and Ken MacLeod. That single moment was an epiphany, and taught me that I was capable of pushing a career higher than the small press in which I’d become established and rather stagnant. Then I got made redundant from the day job in 2007 and at the same time was starting to see regular professional story sales in nice markets. I gave myself two years to get established and went for it. Luckily I hit the ebook market just at the right time, and sold enough back then to enable me to stay ahead of the game. I’m been staying ahead ever since. WF asks: You mention your short story sales to foreign markets such as Japan, Russia and Romania, raising your profile . How did you get into these markets? WM: I did a search online for Foreign Fiction Markets, found some, and submitted stories in the usual manner. I don’t know what else to tell you… they’re there if you look for them. WF asks: Have you ever worked with an agent? If so, what are the benefits? If not, is there a specific reason you chose not to? WM: It’s not that I chose not to, it’s that they choose not to. I’ve been querying agents for many years and none, not one, have so much as asked for a full manuscript. I think my work is invisible to them, as am I. It would be nice to have someone to handle taxes, royalties and chase up subsidiary markets for me — but I’m not holding my breath. WF asks: What is your role vs. your publishers’ in marketing your books? WM: Honestly, I don’t have much of a clue about marketing. My publishers deal with most of it, and I waffle on social media. That’s about it. WF asks: What marketing techniques have worked best for you? WM: See previous question. I have no marketing techniques beyond talking about myself a lot in interviews like this and making friends on social media. What works best for me works for me—your mileage may vary. WF asks: You have 79K Twitter followers and over 8K Facebook likes. How do you use these and other social media channels as a writer? WM: I waffle. A lot. And post snippets of news about the books and story sales, retweets of interesting things I spot going through and more waffle. As for strategy, I have none beyond having a bit of fun. Being sociable is what social media is for after all. And going by my numbers, folks seem to agree and follow me. Some nice folks even share and retweet my content on a regular basis, so maybe I’m doing something right. That said, social media is important to my career, as I live in a remote corner of Eastern Newfoundland, so the opportunities to interact one to one with people in the business are limited. Social media lets me talk to editors, publishers and other writers without leaving my desk. I can’t remember life without it—actually, I can—it involved scores of brown envelopes, expensive printer ribbon, reams of paper and a huge postage bill. Thankfully those days are long gone. WF asks: Aside from the advice you mention on your website (To write, write, write), is there any other wisdom you’d like to share with new writers? WM: Develop a thick skin. Rejection is part of the process and the sooner you realize that and can move on, the easier it’s going to be for you. No matter how much you are in love with your work, there is always the possibility that an editor will hate it, and tell you so. Don’t take it personally, don’t reply to the editor—learn from it, figure out why they hated it… and move on. Keep moving on. WF asks: What are you working on now? When will it be available? WM: I’m near the end of the first of three new novels I have to write in my contract with DarkFuse. It’s called Fungoid and is another cautionary tale of mad science gone way wrong—in this case a new fungus, engineered as a foodstuff, discovers it likes to eat rather than be eaten. It should be along in early 2016 in hardcover, paperback and ebook. WF asks: For someone new to your books, what do you suggest they read first? WF asks: How can we discover more about you and you work? WM: I keep my website up to date with all book and story details, and run a newsletter from there. For general day to day nonsense and updates I’m most often on Facebook.